The mid-1970s. Somewhere in North London. 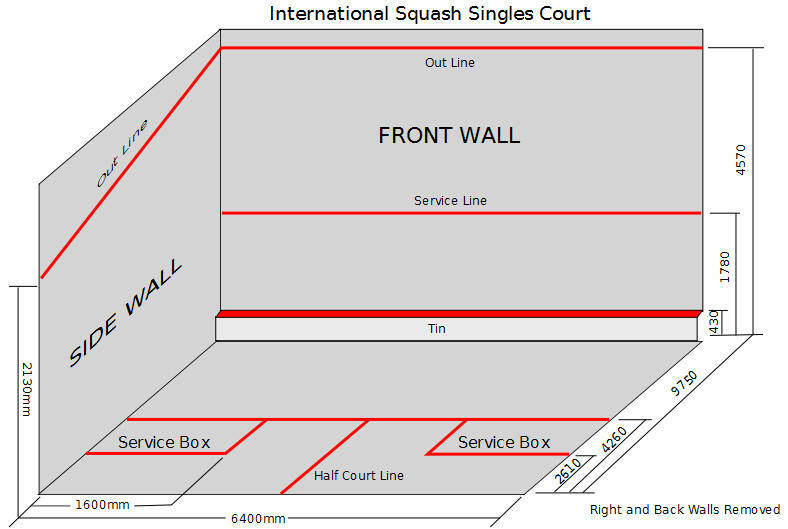 A glass-backed squash court viewed from behind the back wall. The glass is streaked with the dried perspiration of sweaty palms. The front and side walls are pocked with the dark impact marks of squash balls and rackets. Chunks of plaster are missing from both side walls where desperate attempts have been made to dig out good-length balls from the back corners. An empty water bottle lies in the front left-hand corner of the court. Above the front right hand corner of the court, a fluorescent tube is flickering, trying to light. Off-stage, there is the sound of a door opening, its hinges squeaking. The door bangs shut. Footsteps and voices are heard, echoing as their owners walk along a corridor. Two characters enter from stage right; MICK, a dark-haired young man wearing a black leather jacket and track-suit bottoms and carrying a holdall, and DAVIES, an older man, balding, bearded and tramp-like in appearance, wearing a moth-eaten greatcoat and a scarf. Both are carrying squash rackets. DAVIES fiddles with the door-catch and curses. He pushes the door open and steps onto the court. Bloody light. I’ve been meaning to get a new tube. MICK puts down his bag, unzips it and rummages around inside. I’ve got a new double yellow in here somewhere. DAVIES wanders around the court bending down to pick up pieces of fluff and items of litter. It’s like a bloody pig-sty in here. Some people have got no manners. MICK props his racket against the back wall and begins a series of stretching exercises. DAVIES watches him, then looks down at the floor. Is that blood? That’ll take me ages to get out, that will. You’d think people would have some consideration. He scuffs at the floor repeatedly with the sole of his right plimsoll. You could pick something up from that, if you weren’t careful. MICK picks up his racket and steps onto the court. Bit cold in here, isn’t it? Can’t we have the heaters on? DAVIES: I can’t be long, mind. I’ve got to go to Sidcup later and get me papers. He pushes the door shut and starts to warm up the ball, hitting it back to himself repeatedly along the left side wall on his back-hand. DAVIES: They’ve never been any good. MICK stops hitting and catches the ball. DAVIES: The heaters. Old as the hills, see. Can’t get the parts. MICK drives the ball hard at the front wall on his fore-hand. It flies past DAVIES who ducks out of the way. How long did you say you’ve been looking after this place? DAVIES retrieves the ball from the back right-hand corner. I don’t know…about three years. MICK: Made a few quid out of it, have you? DAVIES, still wearing his greatcoat and scarf, turns and starts to drive the ball up and down the right side wall on his fore-hand. MICK (shouting) I said, made a few quid out of it, have you? DAVIES glances at MICK then continues warming up the ball. MICK walks over to DAVIES and shoves him, mid-stroke, towards the right-hand wall. DAVIES stumbles, hits the ball into the tin and falls to the floor. No need for that. I heard. They let me live here, don’t they. Got a couple of rooms out the back. Near the boiler-room. MICK stares at him, then retrieves the ball and resumes knocking up along the left side wall. How long you been playing, then? DAVIES gets up from the floor slowly and walks over to the right side service box. I was in the army. Aldershot. MICK: Oh yeah? That where you got the coat, is it? He laughs, sarcastically, and hits the ball cross-court towards DAVIES. DAVIES hits it onto the front wall, volleys it back to himself twice, then returns it cross-court towards MICK. Never heard of it before I went in. The warm-up continues, both men hitting the ball to each other, then to themselves, practising their shots. MICK: Never heard of what? DAVIES: Squash. Never heard of it. Big rugby man my dad was, see. Hard as nails. Drummed it into us. MICK: Your daughter play, then? MICK: Your daughter. The one you were going to stay with. MICK: Walthamstow? I used to go to the dogs there. Had a little thing going with a few mates. Easy money. Then the law stepped in, so…you a gambler then, are you? He stops to unbutton his greatcoat, then walks towards the door. DAVIES: I’m warm. Taking off me coat, aren’t I. He props his racket against the back wall and fiddles with the door latch. They both leave the court. MICK removes his jacket; he is wearing a navy sweatshirt. DAVIES removes his greatcoat and scarf; he is wearing baggy football shorts and a cricket jumper over a grey shirt. MICK waits for DAVIES to step back onto the court, then follows him and closes the door. DAVIES walks to the left side service box. DAVIES: It’s a damn sight lighter on this side. He starts to laughs, then is overcome with a fit of coughing. MICK starts to hit the ball up and down the right side wall on his fore-hand, then hits it cross-court towards DAVIES. Both men resume hitting the ball to each other, then to themselves. DAVIES: Looking for somewhere to stay, are you? MICK stops knocking up and picks up the ball. I might be. Just for a night or two. Need to lie low for a few days, if you get my drift. You know somewhere? DAVIES: How about fifty quid? MICK: What about fifty quid? I don’t want to stay at the bloody Ritz, do I.
DAVIES: On the match. How about fifty quid? Make it more interesting, won’t it? DAVIES: I’ll make you a bed up. DAVIES: I’ll make you a bed up. Out the back. Not much of a place but…you know. MICK: Who did you say used to coach you? DAVIES: There’s a kitchen just off reception. I’ve got a table and a couple of chairs. How about cheese on toast? I could knock us something up. He resumes warming-up the ball on his back-hand. The fluorescent tube suddenly lights. MICK: You play for the army then? DAVIES: Mind you, the lines are no better. DAVIES points at the floor with his racket. The lines. On this side. Can’t see the bloody half-court line. He looks up at the front wall. I’m buggered if I can see the service line either. Been meaning to get some paint, haven’t I. The bloke I usually get it from’s in hospital, see. Shame. Lost his marbles. Bloody good player he used to be, too. Took a game off…who was it…you know, that Pakistani lad. Or was he Australian? Anyway, he was British Open champion, whoever he was. Used to play at Wanstead. How did you used to get on against him then? DAVIES: Who, the Aussie or the Pakistani? Don’t think I ever played either of them. DAVIES: I’ll tell you what. If you win, I’ll put you up for a couple of nights free. If I win, you pay me fifty quid and I’ll chuck in all your meals. Can’t say fairer than that, can I? No rubbish either. Cheese on toast, nice bit of bacon. You like sausages? Can’t have any booze though. Bloke who owns the place won’t have it, see. MICK: Your daughter ever come here, does she? DAVIES: You can even use the telephone if you need to talk to a few people, like. What do you think? MICK looks at DAVIES then turns and resumes warming up the ball. He hits it cross-court towards DAVIES. Both men resume hitting the ball to each other, then to themselves. The fluorescent tube begins to flicker again. Both men ignore it. To the best of my knowledge, British playwright Harold Pinter is the only person ever to used squash in a major dramatic work as a metaphor for male competition. That play, later filmed with actors Patricia Hodge, Jeremy Irons and Ben Kingsley, was Betrayal, premiered in 1978; I wrote about it in a previous post on this blog. My own hommage to Pinter is based on two of his other plays, The Caretaker (1960) and No Man’s Land (1975). The characters of Mick and Davies appear in the first and the disconnecting and unsettling nature of the dialogue in both. In 2005, Harold Pinter was awarded the Nobel Prize for Literature. He died in 2008. This entry was posted in Squash and Culture, Squash and the Arts, Squash Balls, Squash Courts, Squash Lives, Squash Players, Squash Rackets and tagged Psychologist, squash ball, squash court, squash match, squash matches, squash players, squash racket by Peter Heywood. Bookmark the permalink.